Bromocriptine is a semi-synthetic derivative of the ergo group that boosts dopamine (a neurotransmitter and a precursor of other substances including adrenalin) and slows down the production of prolactin (a hormone released from the anterior pituitary gland that stimulates milk production after childbirth). Past the age of 40 it is estimated that the healthy person undergoes a dopamine decline of approximately 13% per decade. As dopamine is essential for brain activity¸ some neurologists have stated that if we increase life expectancy we shall all be senile! Therefore¸ protection and enhancement of the dopamine producing neurons is a key strategy for anti-aging medicine. Bromocriptine¸ therefore¸ is not only used in the management of mental degenerative conditions such as Parkinson's disease¸ but as a preventative medicine for those wishing to delay age-related mental decline. Its second major anti-aging use of Bromocriptine is the inhibition of Prolactin. Prolactin is produced by the pituitary gland¸ and is one of the few hormones that increase with age. It has been described as a fat synthesis hormone because one of its primary functions is to trigger lactation (milk production) and weight gain in pregnancy. In women¸ Bromocriptine has been used to help restore ovulation¸ but it also helps to reduce serum Prolactin levels in men¸ (although the precise role of Prolactin in men is unclear). In addition¸ some researchers believe Prolactin levels play a significant part in immune system suppression. 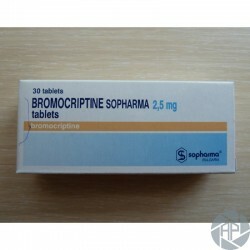 Bromocriptine also effects the most famous of all pituitary hormones¸ Growth Hormone (GH). Bromocriptine increases GH secretion in individuals with normal GH concentrations¸ but paradoxically suppresses GH secretion in patients suffering from acromegaly (a condition of excessive GH production). An interesting clinical study administered a component of tobacco called DMBA to rats¸ at a level where it is known to be very effective in producing breast cancer. However¸ rats that had been pre-treated with Bromocriptine completely avoided any cancer development. Bromocriptine therefore appears to also offer itself as a very potent free radical quencher. One animal study suggested that a further action of Bromocriptine is to alter the CNS (central nervous system) regulating metabolism¸ which helps to prevent weight gain. Take 1.25mg or 2.5mg daily¸ unless treating a serious medical disorder where dosage may differ according to your physician's guidance. Nausea¸ dizziness¸ lowering of blood pressure¸ hypotension and confusion. The first three are relatively common¸ especially when undertaking initial use. It is also known to increase fertility.